Make a mosaic picture - up to 1000 photos & FREE delivery! It’s easier than you might imagine to create a picture made out of pictures. You need just a few minutes to make a mosaic with pictures. Simply choose a main image for your mosaic. Then gather together up to 1000 photos for the background. The more you use, the more impressive your mosaic picture will be. Make a mosaic with pictures in just a few easy steps. You can use up to 1000 photos to make a mosaic picture that is sure to impress as wall art for your own home or as a gift. Receive your unique picture made of smaller pictures in 1-3 days. 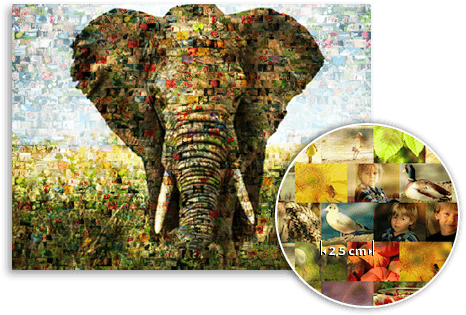 Select the main photo for your picture made with pictures – this will be the main motif for your mosaic. Then upload the small pictures in the app. The more pictures you use, the better. By the next day, we will have created a picture made with pictures for you – a photo mosaic. If you are happy with the picture, simply select a product, e.g. canvas. Now you can order your mosaic picture. We‘ll deliver it to you in 1-3 days.